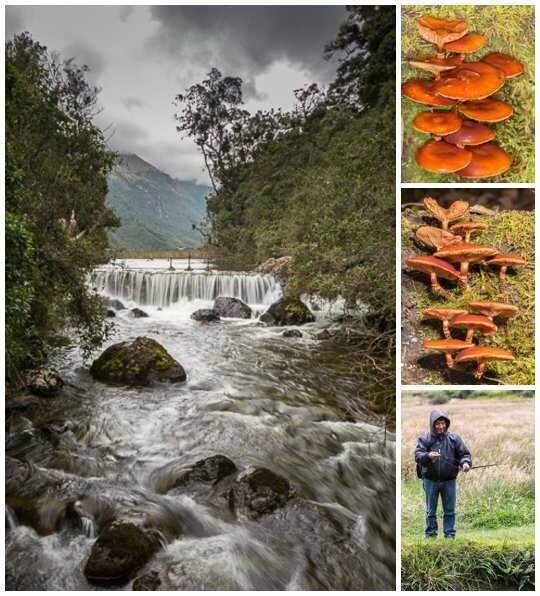 Today was Palm Sunday for the Catholics in town, but we started the day by returning to Lake Zorrocucho in the Cajas, where we spent last Sunday. 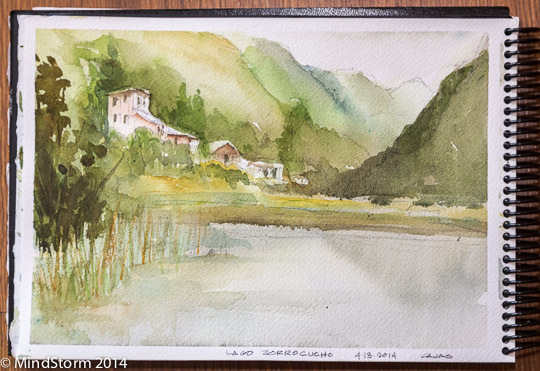 Alberto drove us there again, and then Evelyn painted en plein air. We were joined this time by Shimi — an artist friend from Danville, back in the San Francisco Bay Area, who joined us for a few days. 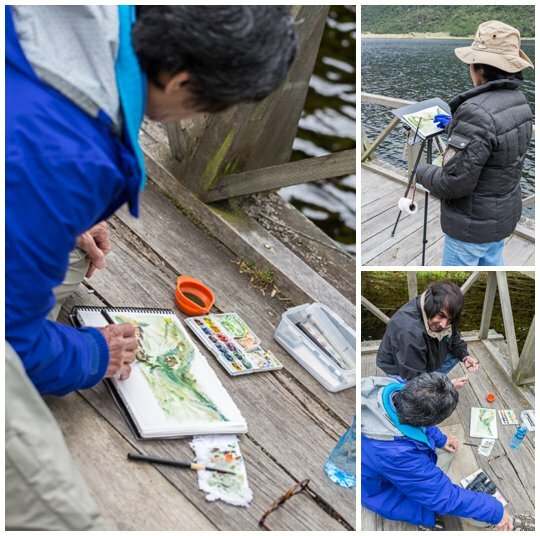 This is the painting that Evelyn worked on for a couple of hours until the chill chased us off to lunch. Lunch was a minor adventure in itself. We went to a small Sunday Brunch place sitting at 11,890 ft elevation. Just going from the car to the restaurant (a short climb up some steps) left me light headed. There was no chance I was going to hike around that lake! When we returned to town, we found a parade going down a street about a block from our condo. This was a Palm Sunday parade, with some people celebrating the triumphant return of Jesus on a path of palm leaves (hence the term “Palm Sunday” celebration), while others jumped the gun and paraded as Jesus carrying his cross down the streets (should be a week from now, but who’s keeping track?). 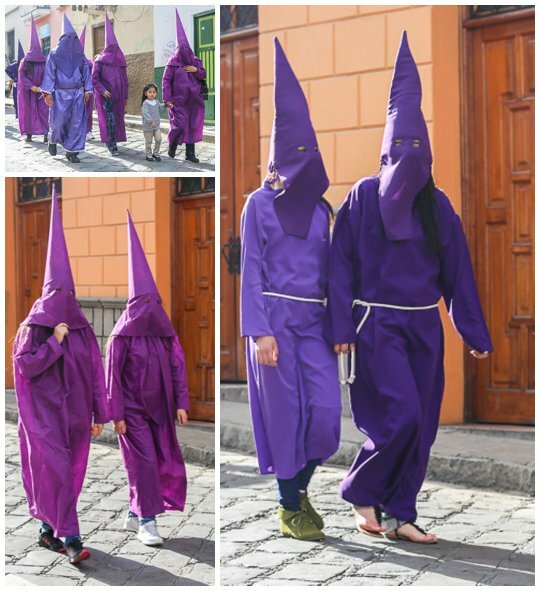 We had heard of these robed penitents parading through town at Palm Sunday, but had not seen it before now. 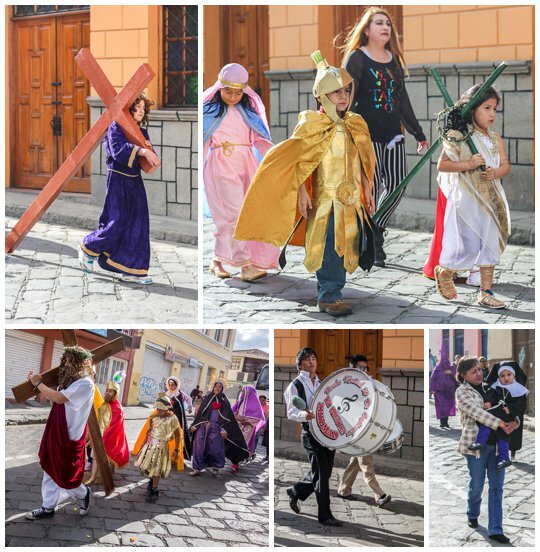 There are a couple of towns in Ecuador that are famed for such costumed parades, and all references we read said that “every town in Ecuador has them.” It was just up to us to find them. As luck would have it, this parade near our condo had several small groups in variants of the hooded costumes, in different shades of purple. We finally got to see them without going into other parts of Ecuador (which we will likely do in future years, but this year is pretty full with travel plans already).